Cuddle up for your next movie marathon in Windsor home's super soft throw blanket. This cozy blanket features fuzzy polyester on both sides with durable corded edges for year-round use. 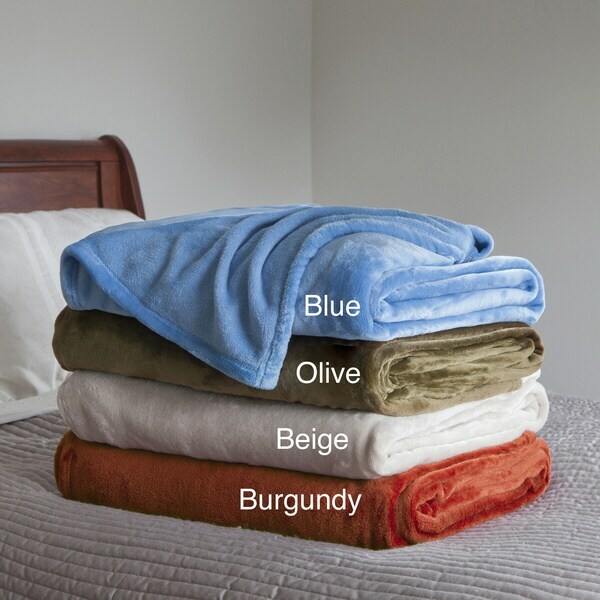 Available in a variety of colors, this 100-percent polyester blanket is machine washable for easy and convenient care. I ordered this blanket in the full size and have been using it as a bedspread during this cool spring. It's warm but not overly warm. Is an olive green color and looks great with my flowered bedding. Happy with this purchase! Love this blanket. Very warm and soft. Washes and dries nicely. Got the queen size but wish I would have bought the King . Runs a little narrow but will be o.k. Love this blanket so much I have 2! Warm and so soft! Can't wait to use it this winter. The color is very nice, a goldfish bronze, good size, very soft, but this blanket sheds a lot. That's a definite problem for me. I was expecting it was a little thicker (only because I'm usually cold). But they are a nice fuzzy throw and will do the trick. Warm but not too heavy. Would recommend it. Fit our king size bed perfect. Great quality! For our king perfectly. Awesome! My teenager loves it! This is such a soft blanket. I initially ordered it for our guest room. It was so well-liked that I ordered a second one to use in a different room! Absolutely great! So warm and light. I ordered the queen size and agree with the other reviewer, it runs a bit small but I should've seen the dimensions. Just FYI, it sheds a bit at first so be prepared to vacuum the fluff ! "Is the burgundy a rust color? It is hard to tell by the image." Yes, definitely a rust color. The photo is labeled 'burgundy', but the details and option selection refer to the color as a 'rusty burgundy', which is more accurate. The color may look different on different monitors too, but the actual color is definitely a rusty tone.